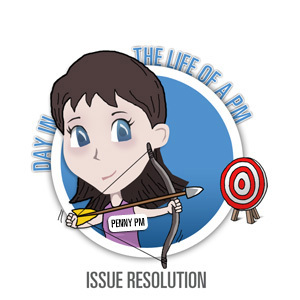 Penny PM started the day “aiming for the bull’s-eye” by resolving issues for the Big Bang Project. Penny PM told the team, “As we discussed in our last issues meeting, the first step in resolving an issue is to identify the issue and communicate to project management. However not all issues are resolved quickly and must be tracked.” Penny PM then told the team that the PMO office has given them a way to manage the team issues with an Issue Tracking tool. showed all of the Project Leads how they can run reports based on various types of selection criteria such as owner, phase of project, description of issue, due date, type of issue, etc. The key to hitting an issue on the bull’s-eye of success is by paying attention, maintaining team accountability and making sure the issue doesn’t impact the project timeline.